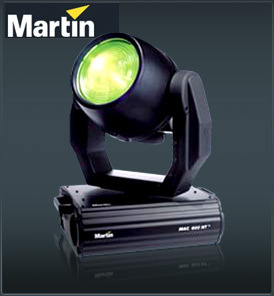 The Martin Mac 600 nt is an updated version of the highly successful MAC 600 wash light. It is an automated moving head featuring a newly designed CMY color mixing system offering virtually unlimited shades and color choices. Useful in a variety of environments - wherever dynamic color wash projection is needed, the Martin Mac 600 nt is perfect for touring, theater, TV and architectural applications. A new, innovative CMY color mixing system provides improved color distribution using a unique color flag system. Virtually unlimited color choices are possible and, together with the color wheel, it is possible to achieve rich reds, greens and blues as well as soft pastel colors. The color wheel houses 4 replaceable color slots offering deep red, deep green and an extra blue plus UV and open. A new color temperature correction (CTC) system makes it possible to gradually vary color temperature. Dedicated anchoring points, a safety wire attachment point, a quarter turn fastening system and a mid-pan-range locator make for trouble free rigging. Convenient, secure snap-locks make for easy component accessibility. Maintenance is simple.